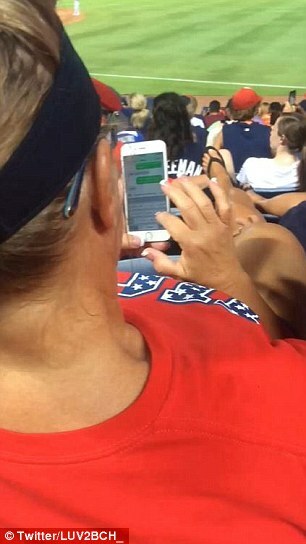 Two sisters confronted a man during the Braves vs Los Angeles Dodgers game on Wednesday at Turner Field stadium. 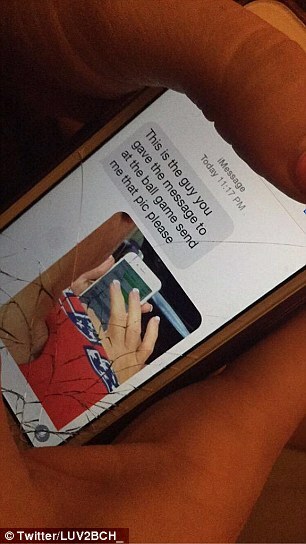 They gave him a note after claiming they saw his wife sending adulterous messages to another man saved as ‘Nancy’ in her phone.The pair posted pictures of the texts and the note online, and the photos have since gone viral. Two sisters attending an Atlanta Braves game claim they helped expose that a man’s wife, who was seated in front of them, was cheating on him. 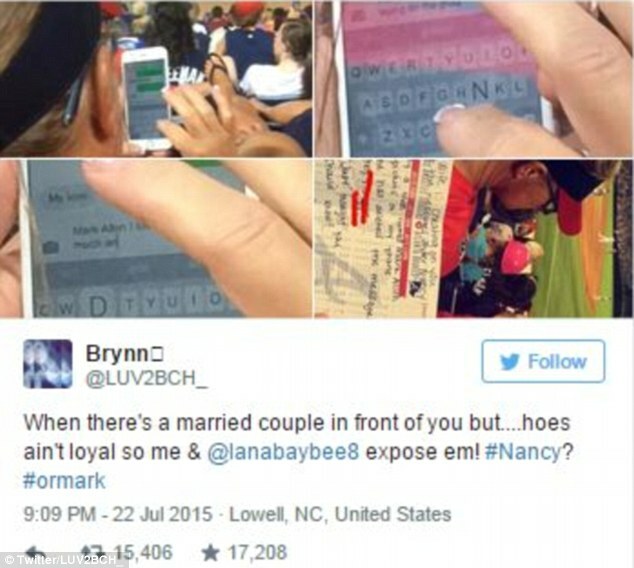 Delana and Brynn Hinson said they were at the Braves game on Wednesday against the Los Angeles Dodgers when they caught the man’s spouse allegedly sexting a man saved as ‘Nancy’ in her phone. They took pictures and posted photos to Twitter of the seemingly adulterous text messages they claim she sent to ‘Mark Allen’, as well as the note, which have since gone viral, Uproxx reported. In a conversation on Twitter, she also wrote that the couple had been married for 29 years. The sisters said they handed the man the note as he was leaving before he stopped and turned around giving them a thumbs up. About 30 minutes later, they claim he messaged Delana asking for the pictures. Some unsure if the act was fake have criticized the sisters saying they edited the alleged cheat’s text messages. However, the pair hit back by posting video of when the note was being written that evening as well as a text that was apparently sent from the man asking for the pictures. Last year in a similar incident, a sports fan during a Detroit Lions football game confronted a stranger after he claimed he saw the man’s very pregnant girlfriend ‘romantically texting’ another man throughout the match. 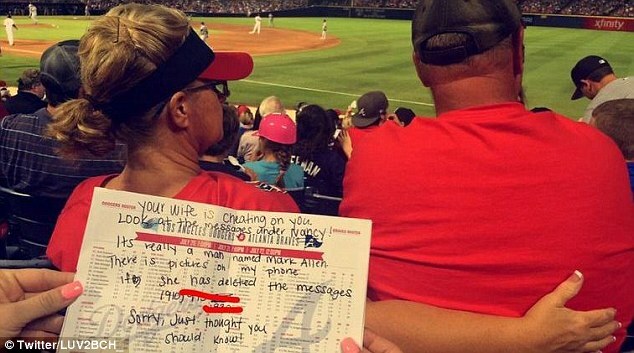 At the end of the game, the man called ‘Lye’ handed the other man a note revealing the alleged adulterous text messages, and later posted a picture of the note and the pair he claimed to be the couple to Facebook. Those images went viral and sparked a heated debate online about whether it’s appropriate to wade into a complete stranger’s relationship. NIGERIA’S BUHARI RETURNS HOME EMPTY HANDED FROM U.S. They seem like very negative people who crave drama. I hate cheaters, but hate people preoccupied with drama even more.